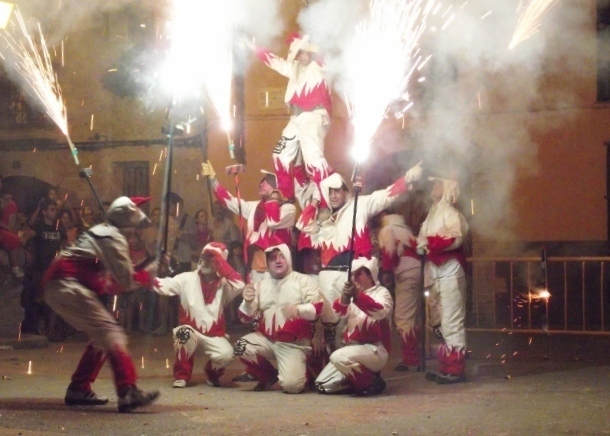 It is the time of fiestas, and one of the special nights in this country is the Correfoc, the night when by tradition the town drives the devil out. 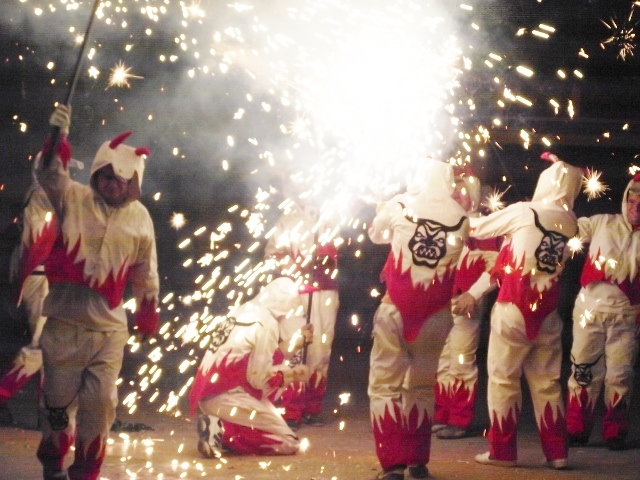 This takes several forms, sometimes there are dragons or devils which are pushed around with fireworks attached to them, each with its own group of devils who then dance and chase their way round the streets whilst holding fireworks on long poles. 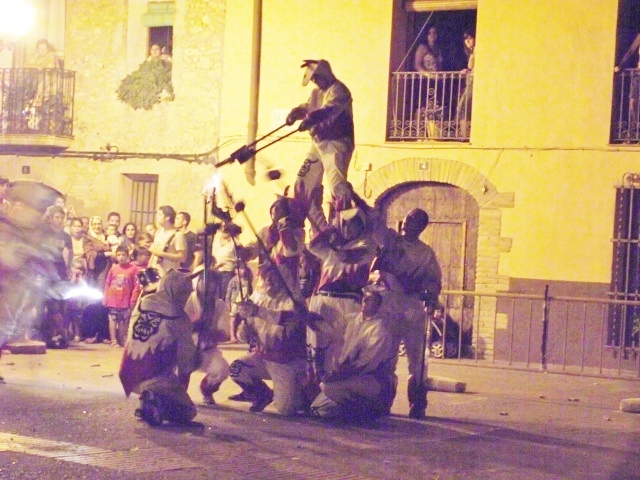 These are accompanied by drummers who beat out their music for the devils to cavort to. 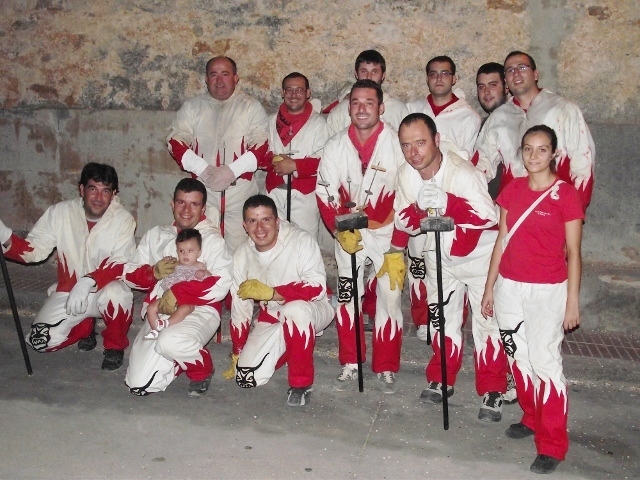 Each group has a different costume, all of which are fireproof. 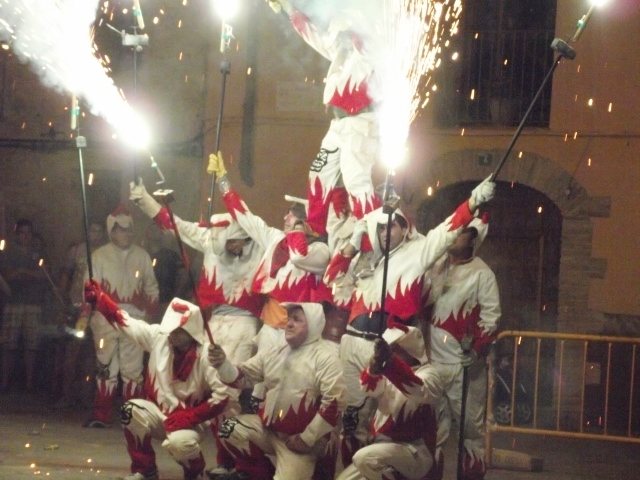 Their have long poles are in the shape of a 2 or 3 pronged fork, to which the fireworks are attached. 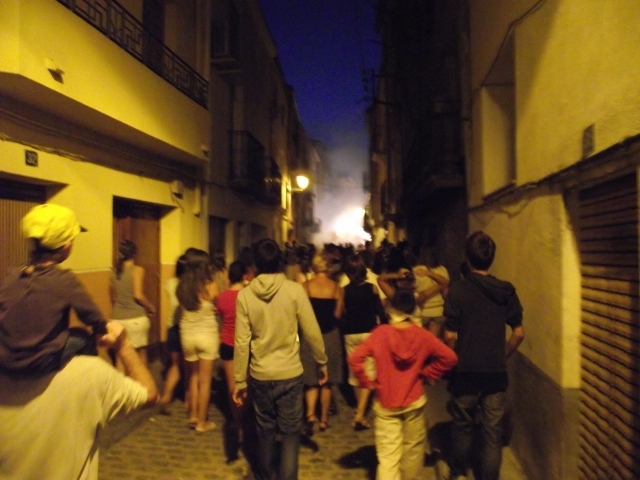 Next there is the man who lights the fireworks, he keeps watch on what is going on. As the fireworks go out they are replaced with fresh ones lit and off they go again. 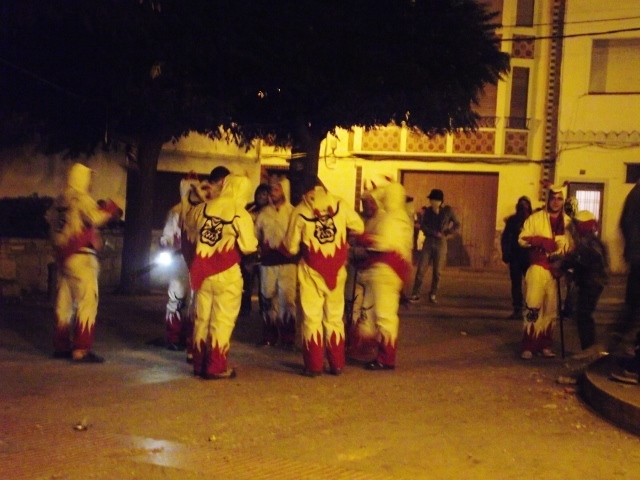 The procession dances through the streets chasing people, who run laughing and squealing out of their way. 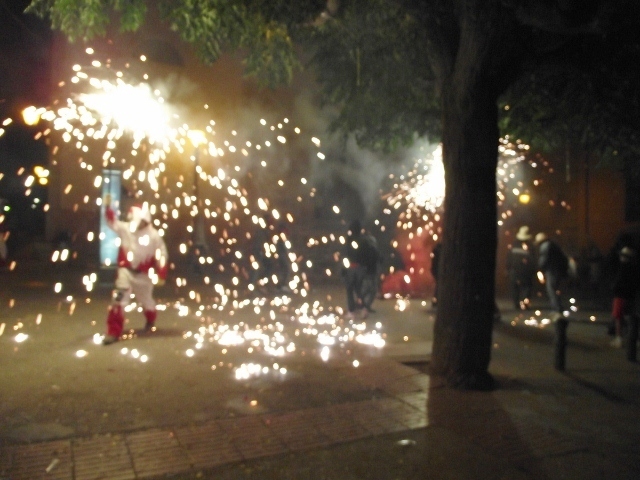 You will see children and adults dancing under the fireworks covered up and enjoying themselves. Before they dance though they all make themselves wet at the fountains so their hair does not singe (and it can). There is a lot of revelry but it is well organised and contrary to opinion it is safer than a bull run. 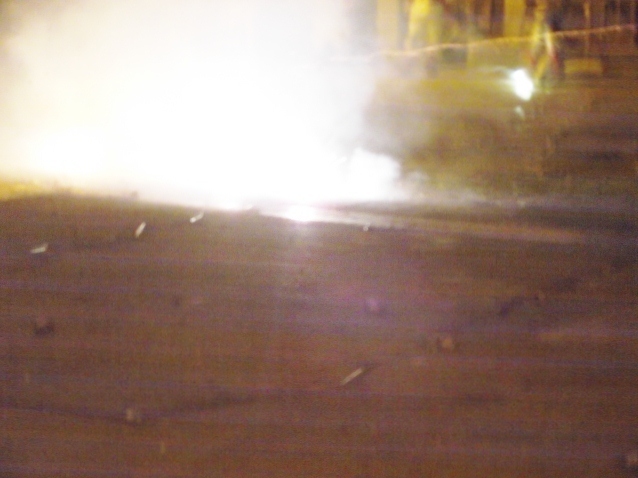 So tonight we went to El Masroig again and had some fun. We arrived just before the group started their display, and were very glad we came. 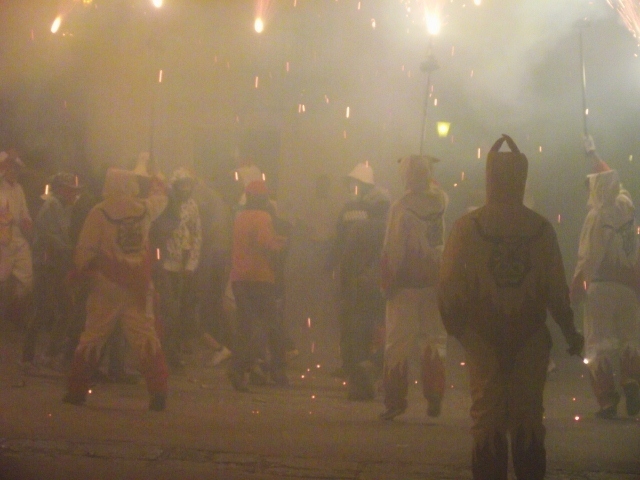 It was fun, with lots of noise and we were even chased by the devils. 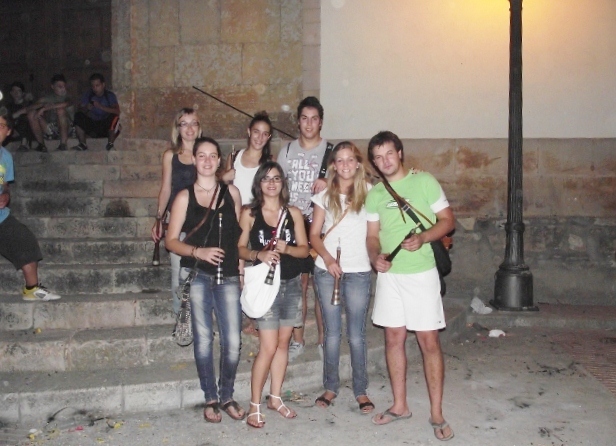 There was a group of young people who played medieval sounding music on wind instruments similar to medieval flageolet and accompanied by a drummer. They follow the devils but stay behind the trolley carrying the fireworks as so do those of us who are not brave enough to get under the fireworks with the devils. So here are the pictures, some smoke riven but I hope you enjoy. This them getting ready for the off. 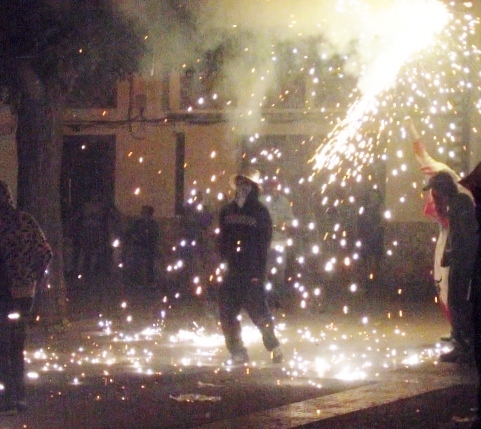 The man with the light in his hand is the one who lights the fireworks, All the Devils wore thick red gloves. 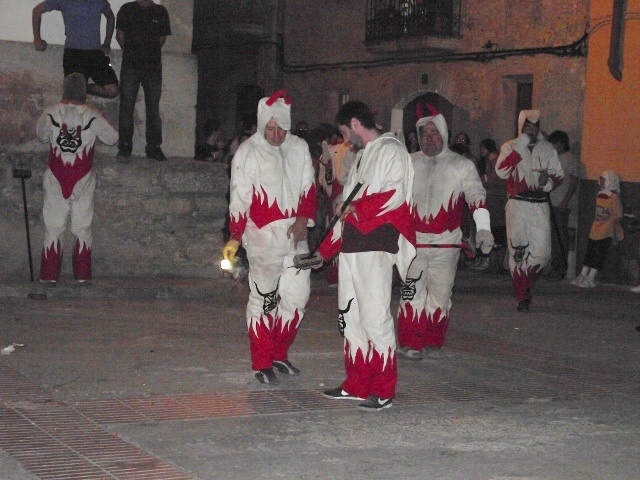 Ok so they have taken us up and down the streets, chased and danced their way round the church square and are now grouped together, they are plotting something! This was the final bit a devils tower, but no! I noticed there were cracker strings being laid out round the square with blue lumps dotted here and there. Then the little devils lit the blue paper stood back and the loudest noise ever erupted, so loud it rattled the windows. We all had our hands over our ears whilst laughing. They had mixed bangers in with the firecrackers, if you look carefully at this last picture you might just see what I mean. 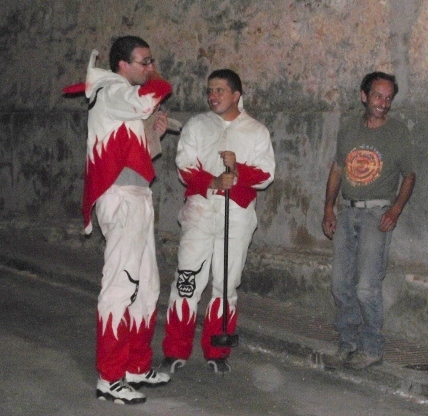 We have not been to El Masroigs Devils Night before but will be going again, we really enjoyed ourselves. Not a Health and Safety bod in sight to spoil the fun long may it stay this way, this is one tradition I sincerely hope never goes away. It really rained last night in fact it was quite a storm. Thunder crashing over head, lightening flashing lighting up the night sky, and rain? not a lot, it rained hard for a few minutes put 500ltrs into the garden cube. So this morning when we eventually woke up, it was cooler smelt fresher and the oppressive feeling had gone. During the storm you could feel the charge so intense was the atmosphere. So the garden. The vegetables looked really well, there are cobs forming on the corn, beans appearing on the stems and the squashes, cucumbers, and melons spreading out over the ground. For those of you who did not know, I decided to try the American Indian way of growing food. They planted corn then grew beans up them and covered the ground with squash which kept the moisture in. Know what, it works here as well. As for the tomatoes, well they are beginning to turn red. We grow these in potato bags, and they are really going strong, there are also radish in plant troughs with rhubarb doing its thing behind the poo patch. The poo patch I hasten to explain is a trench which we filled with a mix of chicken and goat poo – good for rhubarb. Potatoes! Well I planted some in the ground intending to make a patch of them, however when digging them up I discovered not a lot. A small boiling nothing else. So, because the heat during the next two months would cook them in the ground, we are going to plant them in a couple of bins which have had the bottom cut off in the hope of new potatoes for Christmas. I have come to the conclusion that, as we do not use pesticides or chemicals growing needs to be done in tubs etc., Roll on dinner. It is now August and next week will be September, over a month since I began to write this, and not a drop of rain. The only things to survive have been the tomatoes and cuecumbers in the pots. The rhubard is ok but everything else has suffered from the heat. The water was used up last month so I am now considering a system for the garden, albeit late. We usually get a storm or two in August but nothing this year, still life is a learning curve and I am still learning, even the birds water evaporated.